I wonder how many people spotted the ambiguity in the title. What the poster actually advertised was a “family fun day” run by the county police at their headquarters. Although some in our party did not really want to go out that day, in the end we all found something of interest and/or enjoyment from it. I would not give it 10 out of 10 (the helicopter did not show up – presumably having been called elsewhere) but I would go again another year. It was not that the stalls were the latest in entertainment (they were not, but were interesting nonetheless) that made it a good day, but rather that you could mingle with and ask all sorts of questions of different kinds of police officer. For example, a fellow visitor had a fairly long and detailed conversation with an armed police officer about the use of tasers: how they worked, how they were deployed, how often they were used and the effect they had on the people who got caught at the wrong end of one. I did not get the sense of any information being held back. The food was not the sort to write home about but the price was reasonable and the burger tasted OK – for most events of this sort that is actually high praise! The day was open to the public so it was not possible to tell which families belonged to off-duty police officers and staff and which were from the wider community – by all accounts there was a mixture of both. 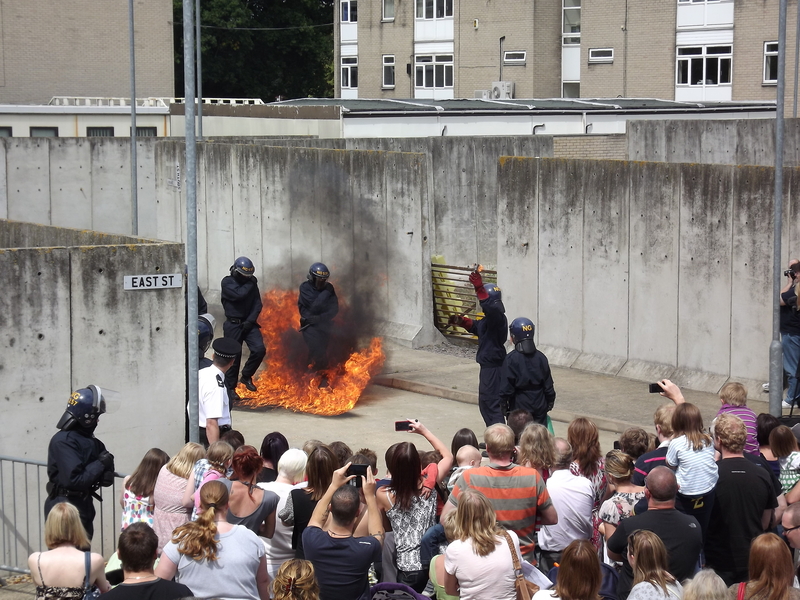 We found the “public order training” interesting and here are a couple of photos from the petrol bomb training demonstration. I appreciate the fact that I was looking at the event with sympathetic eyes and realise that not everyone’s experience of their local police is particularly positive. However, here at least was an attempt to engage with the public in an open and non-threatening way – to allow a passer-by or two into their territory. To do their job the police have to be set apart from the rest of society at least a little bit – hence the uniform. But the point is that they are a-side and not a-bove. When they get it right they realise not just that they serve the community but that they are also part of it. That is why I am reluctant to consider having solely a national police force: a county (or similar) police service needs to realise that it belongs to the community they work among. Most of this post was drafted before the troubles and riots in Tottenham and elsewhere. 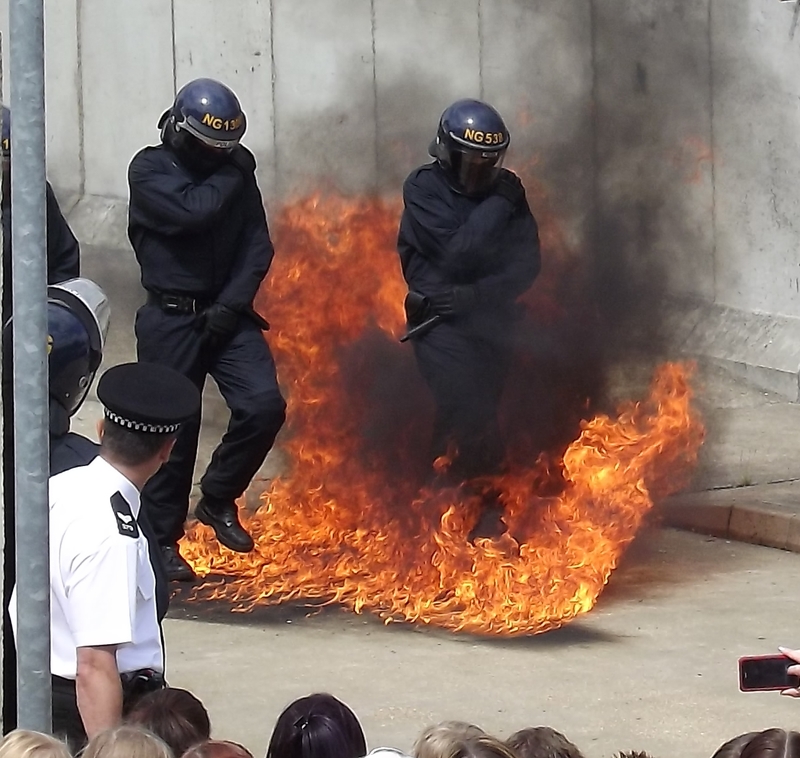 Despite any criticisms, what I observed at the open day still applies and I believe that the British police do manage to get it right a lot of the time.